We all believe that ‘first impression is the last impression’, but how do you impress the hiring manager when you are not in front of them? It is simple, just present them with the perfect resume and half the battle will be won right there. Job hunting is a tough ask and a tiring one too, but if you take the first step correctly, then you will help yourself in receiving interview calls promptly. But, most of the time we end up committing some silly common mistakes on our resume that mar our chances of receiving an interview call. No matter whether you are a fresher or an experienced professional, resume must be polished and crisp. It must be void of some common errors that might take you down. The easiest way of getting screened out even before you appear in front of an interview board is to put forward a best resume that is seriously flawed. 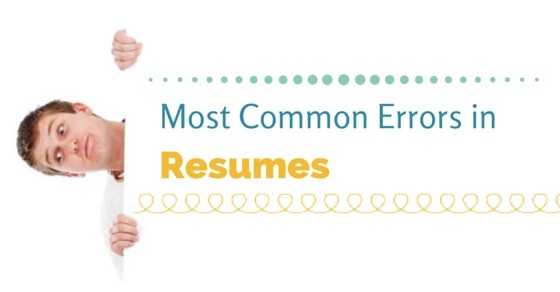 Another common mistake that most job seekers commit is that they create only one resume. When you will be applying to different industries with different requirements, then how can you assume that the one resume that you have created will suit all! You need to make changes in the job summary, so that it suits the job description provided by the company to a large extent. Before submitting a resume, it is important that you proofread your resume thoroughly. Spell check is another important aspect that you must keep in mind while you are proofreading. You can always ask your friends and families to go through your resume, so that they can point out the common mistakes, if any. You must incorporate relevant keywords and industry jargons in your resume. If you are wondering why keywords are such an important factor, then you must know that most companies now review the resume online. So, even before they come to a hiring manager the resume is selected electronically. If you do not use the industry specific keywords, then your resume will be screened out right away by the system. Therefore, you must include keywords in your job description and spread it out all across the resume. While updating your resume, you must stay away from using words ‘responsible for’, and instead you can say that you have resolved issues quite efficiently. If you have been working for several years, then it is ok to have a long resume, but if you have just started off, then a lengthy 2-3 page resume is not acceptable at all. Though there are no such restrictions over the length of the resume, but it is always good to keep it within 2 pages, irrespective of how experienced you are. If you feel that you can create a one page resume, then don’t stretch it over two and if you feel that two pages are not sufficient, then feel free to take up another extra page. You must not stretch it unnecessary and neither should you cut down everything to make it fit into a single page. This is one thing that you must avoid. If a single typo error is there, then it will be a huge blow to your chances of getting selected. So avoid mistakes of such type. You must not opt for wall to wall text, which features six different fonts. Make sure you leave some space and not make use of different kinds of font all around. Instead, you must make your resume visually attractive and soothing to the eyes as well. When you are writing your resume, you are selling your quality to the hiring manager, therefore, you must share the awards and recognition that you have received just the way it is. There is no reason of being modest here. You must update your job/ resume summary only after going through the job description, so that you can match your skills and experience with the job descriptions. Show them how you will be adding value to the role. While updating the general objective for resume, you must be specific. There is no use of writing anything like looking for a change that provides professional growth. Instead, if you write that you want to work in a marketing position that will help you in fund raising by using your experience and skill, then it will be much more fruitful. The experience you have gained by doing the small jobs like time management or work ethics holds equal importance as that of your regular work experiences. Therefore, you must ignore them while writing your resume; instead it will help you in attracting the attention of the employers. Job duties are easy to write, therefore, we often tend to jot down only the job duties. But, this approach is completely wrong, instead we must list out the achievements in resume that we have. The employers will be more interested in knowing what you have accomplished, rather than what your regular duties were.